Google has established itself as the dedicated hardware suppliers; you can see the phenomenal growth in the sales of their smartphones and tablets. Google is just manufacturing of their devices and have no subsidiaries. However, the Nexus 4 is the result of LG Electronics. It is the perfect example of collaboration between the three Tech giants and we can expect a remarkable feat. It is featuring the stunning LG’s design and the Google Android Jelly Bean. The combination of the state of the art hardware and the price are not merely the basis of strong sales, but the quad core Krait 1500 MHz processor and 2 GB RAM clump together with the Adreno 320GPU are also the sound causes. The only colour available is black. 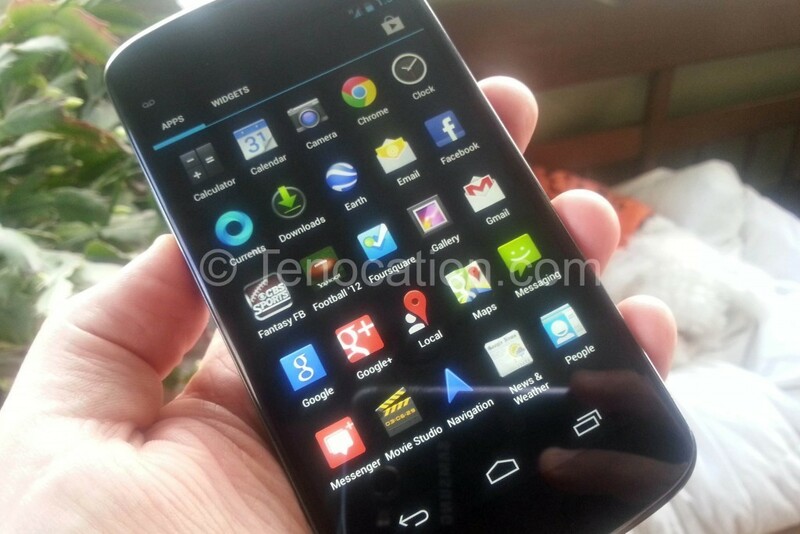 The design of the Nexus 4 resembles with the Samsung Galaxy Nexus it has no significant changes. At the first glance, it looks like the thin black bar, but the precise look at the device will show you the level of the design and material. You will realize that is not the rash design. The non-removable back cover made of the glass just like modern iPhone 4 range. They merely use the polycarbonate on the rim. The bottom bigger part encloses both the ports and the hardware buttons. You will see the tiny downward curve on the left and right outer edge of the Nexus 4 display. The curve is the same as the Samsung is featuring in the Galaxy S3, but in the opposite direction. Susceptibility for the fingerprints on the back and in the front side is an issue; it is the reason why you have to get an extra care. You will get a clattering noise on shocking it, nothing to worry about this as it is only because of the camera image stabilizer. You do not have the colour choices as it is available only in the black. They have made Nexus 4 133.9 mm marginally shorter as compare o the Galaxy Nexus 135.5 mm. The width and the thickness are 68.7 mm and the 9.1 mm respectively. It is also heavier than its precursor. This somewhat large dimension has enabled the manufacturer LG to locate the 0.05-inch larger screen. The interface positioning of the Nexus 4 and the Samsung’s Galaxy S3 is almost similar. On the connectivity side, it seems to fallow the Samsung Galaxy Nexus as it is featuring the micro USB port, which allows the VGA signal transmission. The micro USB port is for not only the multimedia interface, but also it performs two other functions. You can use it as the removable drive while connected with the PC; recharge the battery by the modular charger. The Nexus 4 is featuring the 2100mAh, not removable battery; you cannot replace it by yourself only the technician can do this job done for you. To remove the element of the confusion between different users, the Google has omitted the micro SD for memory expansion. Therefore, at the time of purchase, it is recommended to evaluate the capacity you actually want. It is available in two different capacities, the 16 GB and the 8GB. Googles hottest masterpiece is featuring the Android OS Jelly-Bean-4.2.1. To overcome the bug’s problems in their previous version, they have introduced the updated version of the operating system. The new Operating System is equipped with the few new features, like the “Photo Sphere” and the 360° panorama shoots. The Nexus 4 is featuring some useful communication modules, like the HSPA+ 42. This module ensures the enough speed in the data network, the downstream speed of 42.2mb per second in the UMTS network is possible. The Nexus 4 is equipped with the two camera modules. The back primary camera with the resolution of 8MP. You can use the front-facing camera as a web-cam; this is good for video calling in Skype. The resolution of the main camera and the front-facing camera are the 1080p and the 720p respectively. Everything you should know about Samsung Galaxy S8!